Asslamualaikum wbt and happy Monday all! I think it is time for me to write my honest review on this hyped up stroller & car seat. This would be based on my personal experience and not affiliated with other opinions made by friends and families. As most of you mothers and fathers know, Donna is super expensive for a stroller & car seat that can only be used probably up to 1 1/2 years old but since i am a first time mother and i like new things especially things that can make me move around easier as i love going out to shop and stroll and i hate cramping inside the elevator with a huge stroller. 1. Size. super slim and small! 3. Quite huge after being folded as a car seat. My rear seat belt could not even properly installed as the back of this stroller/car seat is quite huge. As you can see in the picture above, the stroller/car seat is quite huge compared to my hatchback car. Well, maybe cause my car is small. Hehe. Let me share my experience handling this as a stroller first. 1. I love how small it is we can just fold and go up the escalator (of course without the baby inside) and no need to wait for elevator anymore! 2. Very smooth turning and easy to maneuver. 3. 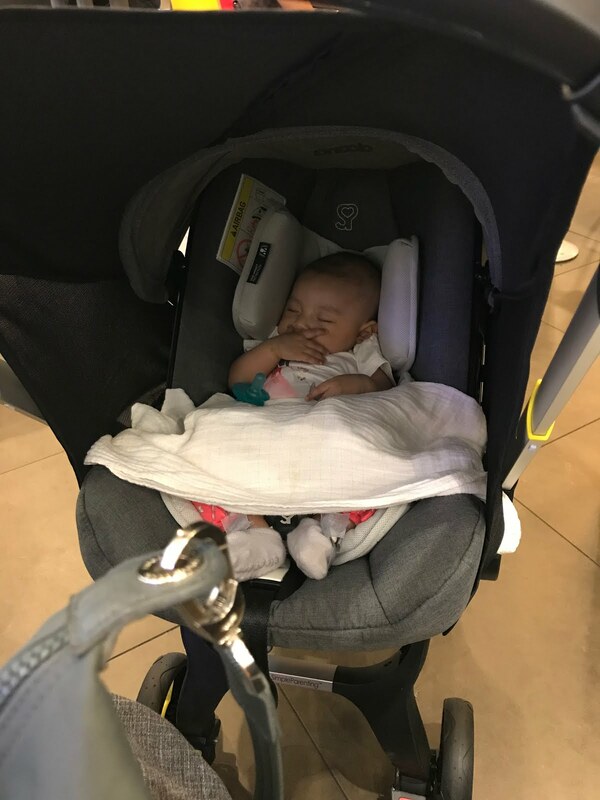 Simple and no need to wake my baby up to just transfer her into another stroller. 4. We also have a travel system stroller before this but it takes a lot of our bonnet space so this one really saves up the space a lot! 1. 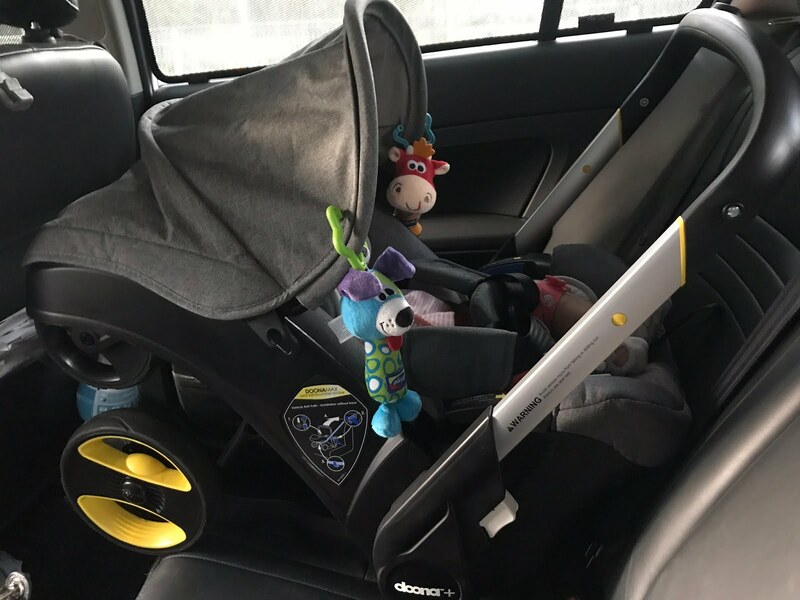 I love how sturdy this car seat looks like with the infant attachments and head protector. 3. 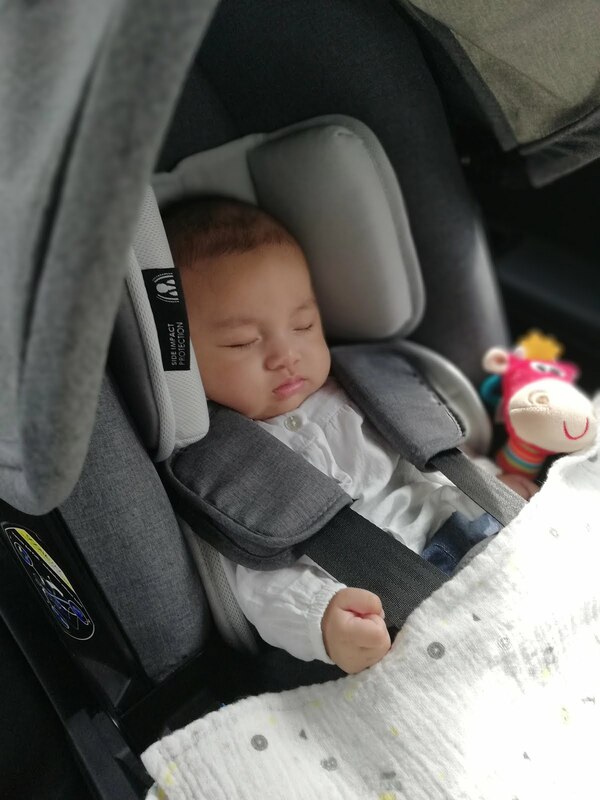 Looks super comfy, my baby can seat comfortably inside this car seat for a maximum of more than 1 hour. She can even sleep by herself inside this car seat. Overall, i am happy that i made this purchase and it really does help up us to move around easily and i do not have to worry about our car bonnet space anymore. The only thing that bothers me now is that i need to purchase the isofix base (which is expensivo!) so that it could stay fixed during our journey to jalan-jalan cari makan. Hehe. So, my overall verdict is that, I LOVE this Doona super much and it was worth it every penny of my salary just to purchase this. Haha. Happy mom detacted here. 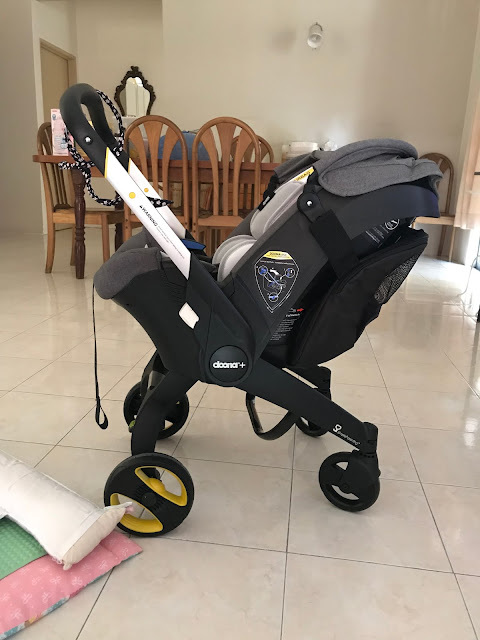 If you are looking or still surveying on purchasing this stroller/car seat, you could try it first at HappiKiddo and see if your baby likes it or not. Mind you that if your baby is quite chubby, it might not feel comfortable sitting in this stroller for a long time. So go and test it out before buying cause this one is expensive for a one set stroller/car seat.